Yesterday we revealed 2 Ways To Instantly Average Order Value. Today we cover implementing “Pre Checkout Upsells” with a clever spin. Upsells are all about increasing average order value (AOV). And there are two types of upsells, pre-checkout and post-checkout. Today we are focusing on pre-checkout upsells because most users are ready to purchase by the time they view their cart. The pre-checkout upsell makes use of that urge to purchase by offering additional related products before they reach the checkout page. Typically you’ll want to display additional Shopify products based on which products the customer has already viewed or based specifically on which products are already in their shopping cart. In-cart upsell is a Shopify app you can download here. Once installed on your Shopify store, you should see more sales with laser-targeted 1-click upsell offers. 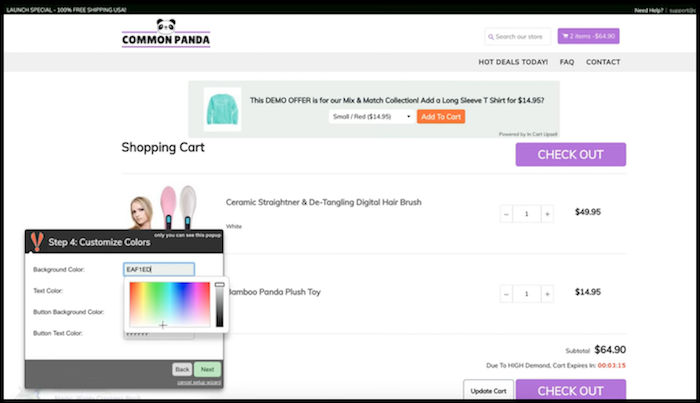 As your customers shop in your store, In Cart Upsell recognizes the contents of each shopping cart. When customers begin the checkout process by viewing their cart, one of the offers you’ve setup, asking if they’d like to add the item to their order. You can also target offers based on shopper location and item quantity in the cart. Once installed, you’ll be asked if you want the beginner or pro package – beginner is fine. After you choose your plan, you should be automatically redirected to the app’s dashboard. Click “Run Setup Wizard” underneath “Step 1” on the “Home” tab from the app dashboard (make sure your popup blocker is disabled). From here on out, just follow the prompts from the Setup Wizard that appear on your screen. 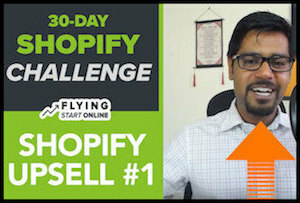 After you complete Step 1, you’ll be taken back to the app’s dashboard within your Shopify store. Follow the 5 offer setup prompts on the next page – filling out each form according to your own product needs. Be sure to check your new site functionality on your mobile devices as well to ensure everything appears as it should. From within your Shopify store dashboard, click “Online Store” from the left sidebar. Once on the next page choose “Customize” from the top right. On the next page you’ll see a mobile device icon on the bottom left. Click that to see a real-time preview of your site on a mobile device. Product Upsell is another Shopify app and you can download here. This app allows you to offer relevant add-ons, or upgrade specific products based on customer cart content, total cart value, or even a combination of both. With the upsell app you’ll have the ability to create as many offers as you want and present them customers at the last moment before the point of checkout. You can offer a single product, multiple products, or something based specifically on what’s already in their cart. For example, if they buy a GoPro you can offer them a waterproof case to go along with it, but if they buy a Macbook Pro you can offer them a laptop case. This is the final App we’re mentioning today – you can download here. It eliminates the guesswork of optimizing your store by watching recordings of website visitors. This will reveal exactly why and where they didn’t convert. You will be able to see every mouse movement, click, and scroll which helps to answer the question of what visitors are really doing on your website? My suggestion would be not to go on a huge App buying spree until your store is at least generating revenue. That’s it for Day 22 – Well done! P.P.S. Click here for Day 23!